After Iraq, led by Saddam Hussein, invaded Kuwait in 1990 U.S. President George Bush Senior stated "No more Munichs" placing sanctions on Iraq for its departure from Kuwait. 30 countries formed a coalition together with a number of arab countries against Iraq. Bush did in the end not invade Iraq for fear of losing arab support. 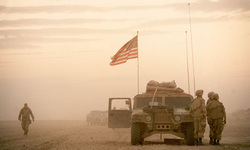 View Gulf War and over 3,000,000 other topics on Qwiki.